"This young dog is very impressive when he steps in the ring, excuding the strength and nobility that is prized in this breed. A very direct, eager, and self-confident demeanor, with a well balanced body and a strong, masculine, noble head. Going around the ring, he was smooth, holding his topline, reaching from the shoulder easily, with a strong drive from his hindquarters. Definitely a dog that has an exciting future." "This is a very well balanced dog with impressive suspension and drive. He is not overdone but presents as a commanding, well pigmented, masculine dog with good topline and effortless gait. His attitude for the show ring is enviable and reflects solid temperament. 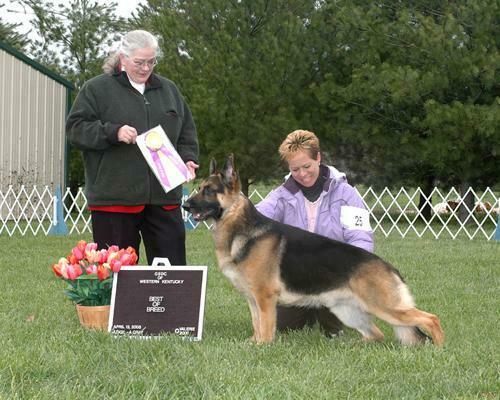 He is just an overall nice package that would have no difficulty competing in specialty and all breed rings. I look forward to seeing more of this young dog and following his show career. "